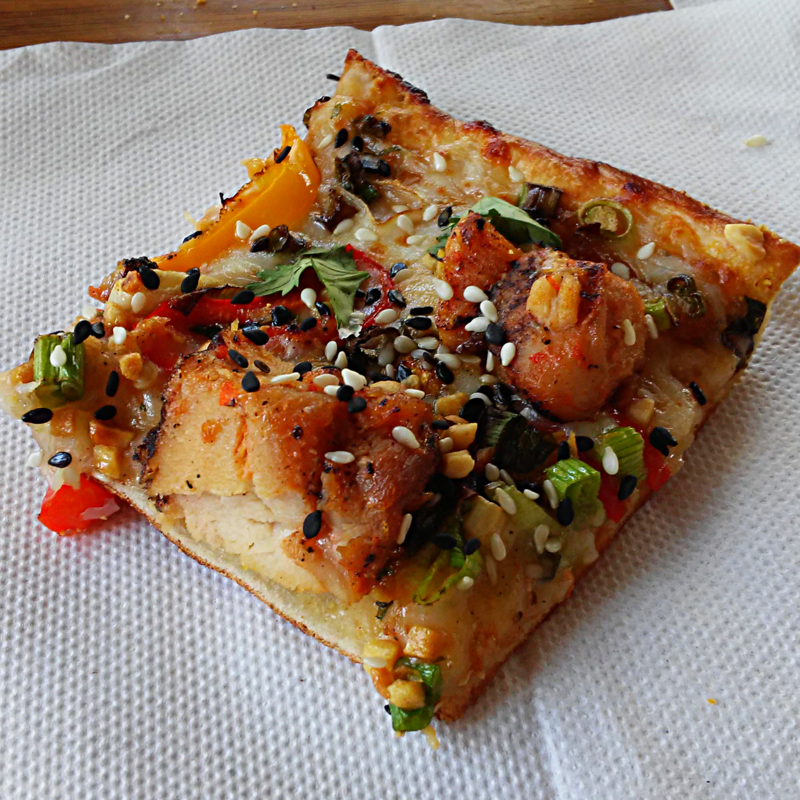 A slice of the colorful and packed "Thai Dye" pizza. The newest pizza to hit Skinker is fast, flavorful, and ... oblong? The latest endeavor by Pi co-founder Chris Sommers, ‘ZZA Pizza and Salad (282 N. Skinker Blvd. 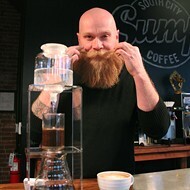 ), opened last Friday next to Bobo Noodle House and Kayak's Cafe. The fast-casual eatery hopes to appeal to students, families, and connoisseurs looking for a casual pizza experience in-store or to go. Named after the slang term for everyone’s favorite meal, ‘ZZA currently offers nine varieties of pizza — including the colorful “Thai Dye,” which features crispy garlic, spicy chicken, black sesame, peppers and peanut sauce, and the light, zesty “Rocket,” topped with prosciutto, arugula, parmesan and lemon. 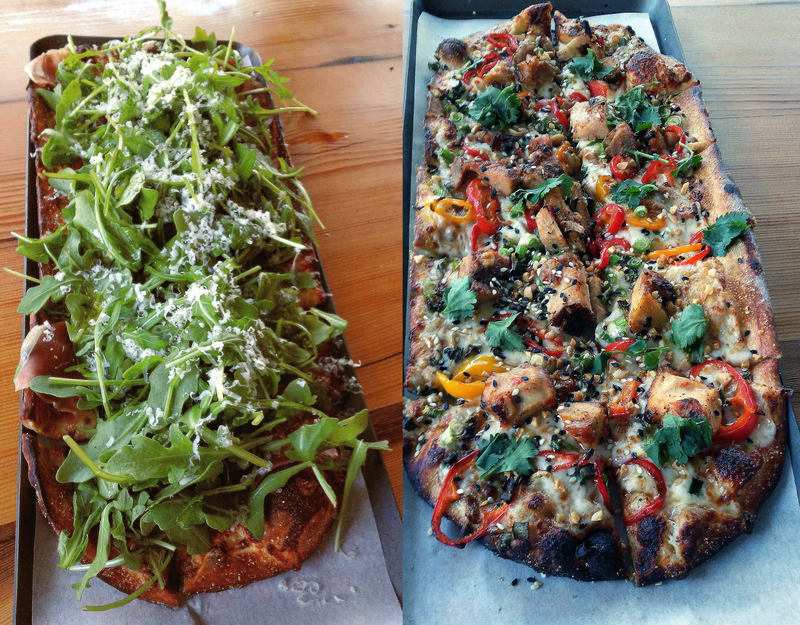 The fresh, zesty "Rocket" (left) and the spicy "Thai Dye" pizza (right). Although there’s a wide range of flavors to try, ‘ZZA is consistent in its presentation and pricing; each pizza costs $9 and clocks in at about a dozen square slices. Service is fast, too — thanks to the quick-working employees and high-heat convection oven behind the counter, pizzas are ready in only a few minutes. The pizzas, which hit a satisfying balance between “serves one” and “overloaded with ingredients,” come on a football-shaped cornmeal crust that plays to both sides of the grip debate; each piece is easy to hold — or fold. It’s thin enough to not get in the way, but structurally sound enough to keep it all together without falling apart (looking at you, St. Louis-style cracker crust). 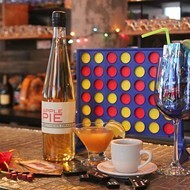 Of course, what’s pizza without booze? ‘ZZA stocks a refreshing selection, with 4 Hands IPA and Schlafly Kolsch on draft, and cans from Stone and Left Hand Brewing. And, for the classy, discerning diner, ‘ZZA offers single-serve wine pods. 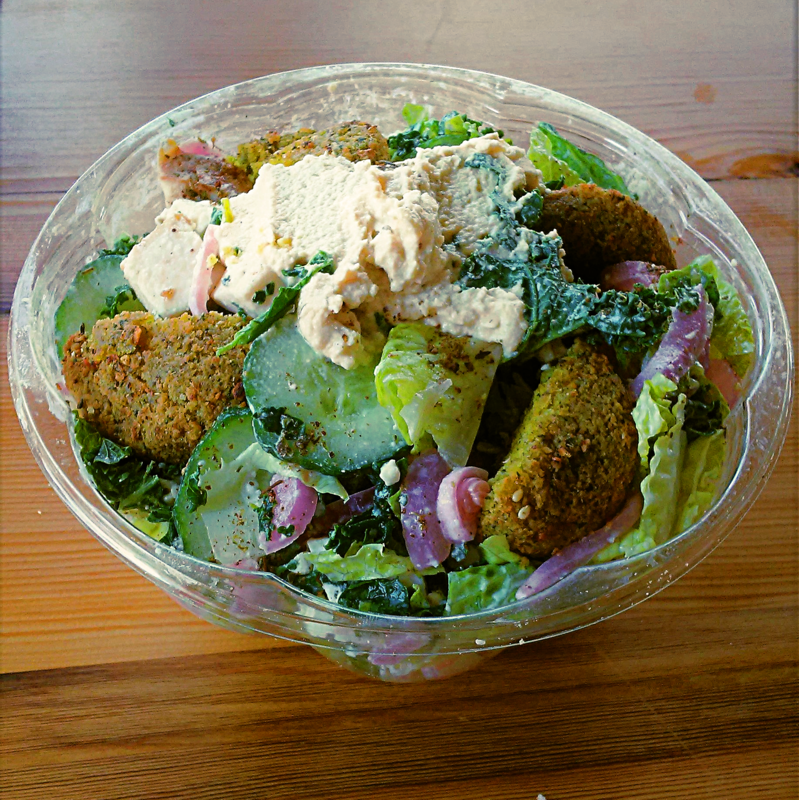 ‘ZZA also sells seven salads, including the “ZZA’lafel” — a Greek-inspired kale and romaine salad with falafel, chicken, and a yogurt-mint dressing. Although the $9 price tag (and corny names) might leave some diners skeptical, the salads are filling and, in some cases, larger than the pizzas themselves. It goes without saying that, if any menu items aren’t to your liking, the pizzas and salads are fully customizable (and gluten-free, if you desire). The corner space is well-organized, with plenty of seating at tables and at the window. The friendly staff, modern décor and relaxed atmosphere make it an accessible addition to the Skinker-DeBaliviere neighborhood. 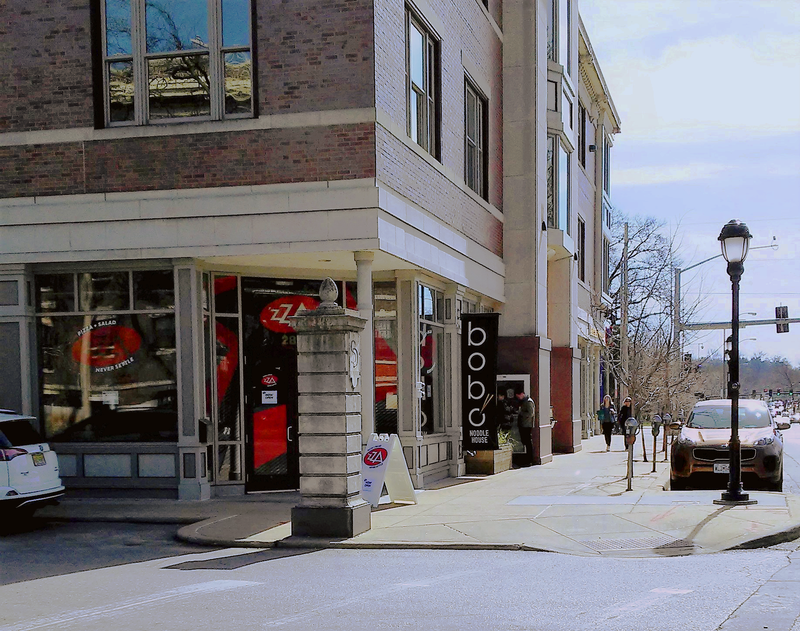 ‘ZZA is open 11 a.m. to 10 p.m. Mondays to Saturdays and 11 a.m. to 9 p.m. Sundays. A downtown location is also in the works, according to the 'ZZA website. 'ZZA is now open at 282 Skinker Blvd. 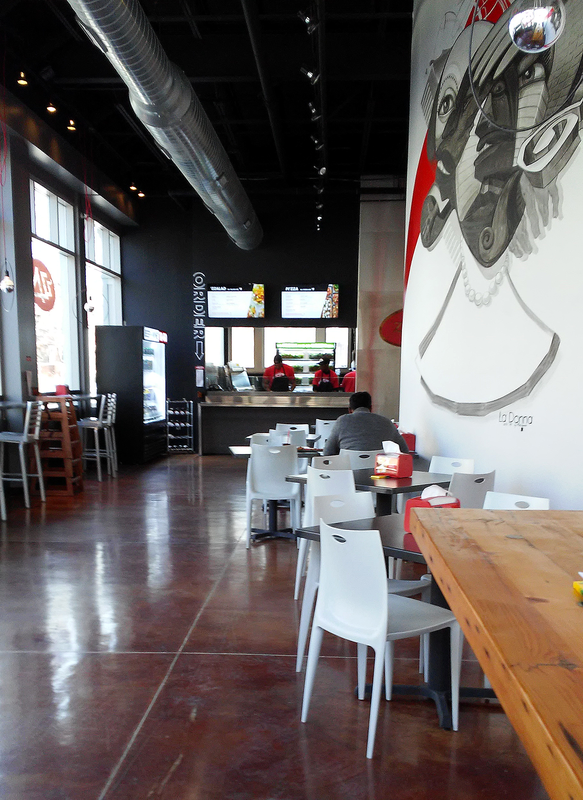 'ZZA features a spacious layout for in-store eating or takeout.